Add dry masalas & salt with 2 tso water to prevent from burning dry masala. Now add 1 cup of water, bring to boil. 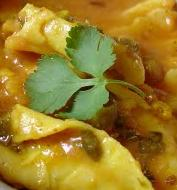 in boiling gravy add papad tore into small pieces. bring to 1 more boil. Garnish with coriander leaves & serve wid chapatis.